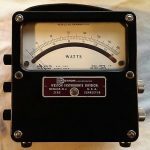 In this episode Shahriar demonstrates the principle of operation of a purely passive Weston watt-meter manufactured in the 1950’s in Newark, NJ, USA. This watt-meter makes no use of active devices (tube or solid-state) and yet is able to measure real-power both at DC and AC. The teardown of the unit shows the construction of two coils interacting to advance the needle on the display. One coil produces a magnetic flux proportional to the current input and the other coil produces a magnetic flux propositional to the voltage. The interaction of the flux moves the needle proportional to the total power which is the product of current and voltage. The instrument is then used in conjunction with a power supply and electronic DC load to verify its functionality. In this episode Shahriar investigates the failure of a GW Instek 1080W power supply capable of providing up to 80V and 40A of programmable output voltage and current respectively. The power supply does not power on. However, relay noises can be heard inside the instrument during power on. Teardown of the unit reveals a modular design with PCBs on all sides. The instrument comprises 6 different modules and 3 complete power supplies in parallel. The controller circuit is powered from the middle power supply module. Examination of the boards reveals three separate failed devices. The in-rush power resistor which prevents the main supply board from startup, a damaged MOS power transistor on the supply output and surface mount resistors. All components are replaced. 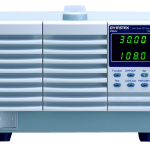 The instrument’s performance is verified with a BK Precision 8601 electronic load. These fast pulse generators are rated to below 25ps! The modules are examined and various microwave and design considerations are explored. The block diagram and functionality of the final output driver is also described in details. 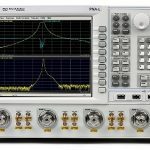 The units are used to measure the rise and fall time of various oscilloscopes ranging from 300MHz to 13GHz of analog bandwidth. You can purchase your own fast pulse generator here. 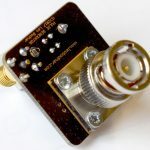 This GPS disciplined oscillator not only provides frequency synchronization to the GPS clock, it also provides programmable outputs on two independent channels using a Silicon Labs synthesizer IC. The complete module acts as standalone unit which only requires power and GPS antenna connection. The full schematic and block diagram of the synthesizer chipset is presented along with measured output waveform, frequency an phase noise at 1GHz. You can purchase your own GPS DO here. This soldering iron which supports QC 3.0 is the followup of the very popular TS100 soldering iron. The unit can operate with up to 18W of power from 9V. However, it does not support PD on USB-C. By using the AVHzY USB tester the power bank can be configured to provide any desired output voltage and deliver up to 28W into the TS80 soldering iron. Using this method, the TS80 soldering iron can easily solder large components on a wide ground plane. The TS80 soldering iron can be purchased here or internationally from here. The Ankar PD+ 28600mAh power bank can be purchased from here and the AVHzY USB tester can be purchased here. 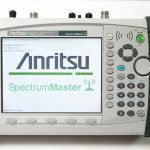 In this episode Shahriar investigates the failure of an Anritsu MS2712B 1.7GHz portable spectrum analyzer with built-in tracking generator. The instrument is missing the main firmware flash card which is easily replaced. A full teardown of the instrument is presented with focus on both the tracking generator PCB and main RF deck. Various ASICs and microwave components are closely examined. To help with removing and replacing many microwave screws, a Hitachi electric screwdriver is used which can be purchased here. After re-assembly of the unit, it becomes apparent that a mechanical push on the RF deck causes the LO1 PLL to unlock. This points to a fault in one of the microwave components. The issue is traced to a broken solder joint inside of the VCO modules. After repair, the instrument functions normally. The performance and tracking generator functionality is verified by measuring a tuneable band-pass filter. In this two-part episode Shahriar repairs an Agilent N5230A 13.5GHz PNA-L which suffers from un-leveled output in full frequency sweep range. The instrument is not able to produce any outputs above -25dBm above 10.5GHz and shows below specification output power levels below 10.5GHz. Teardown of the unit reveals various microwave modules with the SSLAM final module responsible for amplitude leveling and frequency multiplication for frequencies above 10.5GHz. Teardown of this module shows a collection of MMIC dies wirebonded together using micro-strip ceramic pieces and interconnects. MMIC include switches, amplifiers, filters, multipliers, power detectors and attenuators. After examining the input/output signals of the module it becomes clear that the input switch IC is damaged. Unfortunately, an attempt to replace the die with a packaged QFN GaAs device fails. However, a lucky eBay find of a used SSLAM module saves the day and the instrument is restored to full functionality. Some measurements of an packaged evaluation board of a GaAs IC is demonstrated using the newly repaired PNA-L.